Scale the largest original jungle gym! 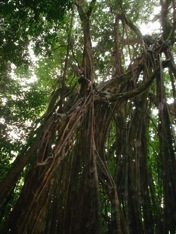 You are top roped while climbing an enormous, user-friendly Strangler Fig tree, roughly a 70 foot ascent. The level of difficulty is determined by the “root” you select (pun intended). After exploring the lofty perch and view of the ocean there is an exhilarating freefall/swing that brings you safely back to Earth. 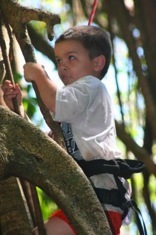 Ages 6+; please wear hiking boots, tevas or sneakers. Bring a camera and binoculars if you like. Just hikers extra charge. Enjoy four waterfalls + four hours of adventure in a truly beautiful deep forest setting. 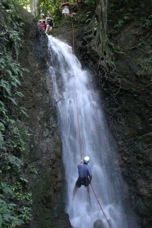 Challenge yourself and enjoy an extraordinary day with rappelling, also known as abseiling or canyoning, into the heart of the jungle through a wild river canyon at El Remanso. A short walk down a trail gets you to the river where you put on your harness/helmet. After a short safety/instruction talk, you descend down the rope while being belayed with a backup rope.